Share The Blessing – HELPING FAMILIES IN NEED IN THE SUSQUEHANNA VALLEY ENJOY THE HOLIDAY SEASON SINCE 2004. HELPING FAMILIES IN NEED IN THE SUSQUEHANNA VALLEY ENJOY THE HOLIDAY SEASON SINCE 2004. Contribute now by using a check, credit, or debit. Click here to nominate a family in need today. Share The Blessing is a not-for-profit organization dedicated to helping individuals and families in need – and who live in Susquehanna Valley – enjoy the holiday season. We facilitate this through the collection of monetary donations that are used, in full, to provide hope and assistance to local families during a very blessed time of the year. Launched in 2004 as a community outreach project, Share the Blessing has grown from the sincere desire to provide relief for over individuals and families in crisis into a Central Pennsylvania-wide initiative fostering a sense of community. Over the past five years, Share the Blessing has gained the support of many local residents and families seeking to give back to their own community-having raised more than $570,000 for over 850 families and individuals in need. 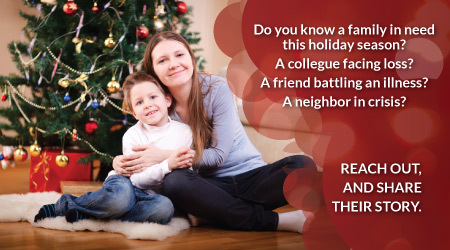 The campaign invites residents of Susquehanna Valley to nominate individuals or families living in the Lancaster community who are in need of extra care and attention this holiday season. Nominations should focus on local families in crisis or need; all individuals/families nominated and/or selected will remain anonymous to honor their privacy. Past nominations have included families undergoing many forms of personal hardship – from those battling disease and crisis, to those displaced or estranged from family due to natural disasters and the War on Terrorism. Share the Blessing is held every holiday season, from mid-November through the Christmas holiday. The program is presented, in conjunction with Central Pennsylvania media partners WGAL, WDAC 94.5, and WROZ 101. *Share The Blessing is an approved 501C-3 charitable organization. Contributors should consult with your accountant or personal tax preparation expert to determine deductibility of any donation. © 2004 - 2016 Share the Blessing.